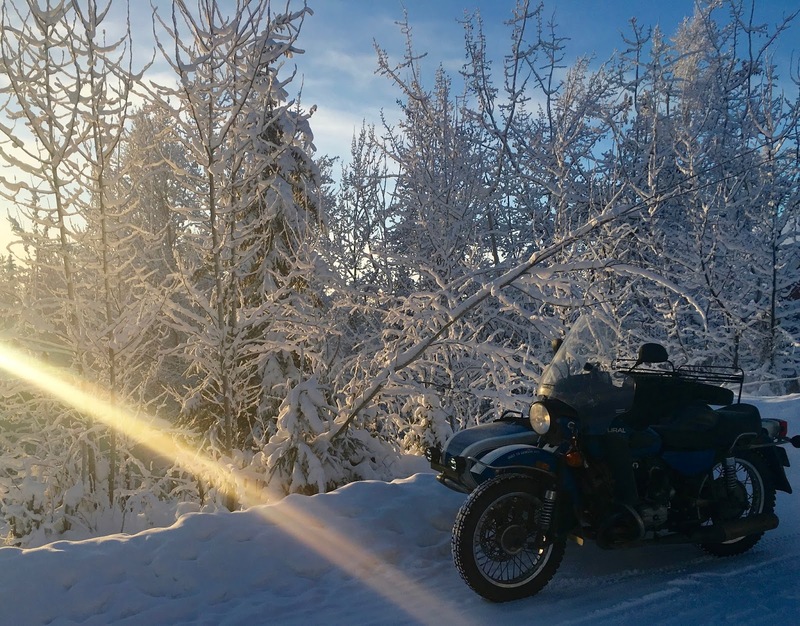 After my last post, I had decided to only ride when the temperatures were "reasonable" like maybe above 0°F. It was such a beautiful, sunny day with lots of frosty trees, I couldn't help but go out again this morning. This picture was taken after I arrived back home from what has become my morning "commute" i.e. College Coffeehouse. 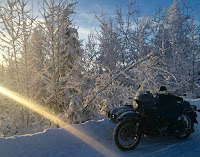 Plus, I needed to fill up the Ural. I don't know if I posted a shot of the O.A.T (Outside Air Temperature) indicator before. The previous owner, Gearloose on SovietSteeds, had installed it in the windshield and it should be familiar to anyone that flies in small aircraft. It kind of looks like an oven thermometer but it actually is from an aircraft. I didn't use it to record temperatures in the PBC videos last year as only electronic, mercury or alcohol thermometers were permitted. 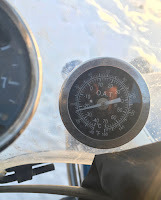 It looks like it is indicating around -8°F. Much warmer at home than it is in town at this time due to a mild temperature inversion. That is, warmer at higher elevations so the cold air and smoke get trapped closer to the ground. This contributes to poor air quality whenever we have an extended cold spell. Lots of politics around this topic due to restrictions on burning solid fuel (i.e. wood and coal) whenever it gets really cold. Just when many need the heat. The forecast is for some warmer temperatures pretty quickly. Hopefully, it'll stay below freezing. This place shuts down if it gets that warm as the roads become almost impassable. Definitely have to agree with you there. 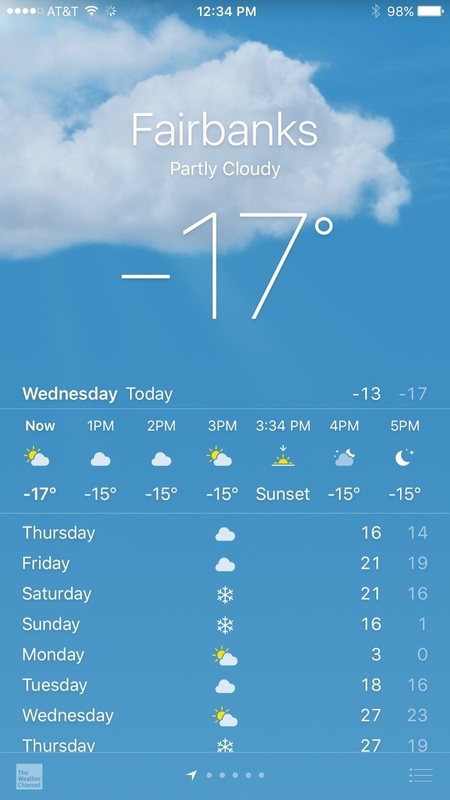 -17°F here in the interior isn't anything like -17°F somewhere where it's more humid like along the coast. I don't think there is anything more beautiful than driving along a road lined with frosted trees ... thankfully, for me it can happen at much warmer temps too. I agree! I really enjoy the frost and snow covered trees. It doesn't look the same at warmer temperatures. No problem as I generally get out somewhere just about everyday on the rig. Usually not very far maybe 10-20 miles on any given day. It took me several years to formulate (realize) a less than mathematical calculation for riding in the cold. I've come to the conclusion that riding temperature is directly related to age, therefore I simply don't ride below my age. My theory is that young 20 to 29 year olds can handle 20ºF to 29ºF, and as an example a 32 year old can tolerate 32ºF. I at a spry 45 years will only ride above 45ºF, so as it is currently a chilly 42ºF outside I shall wait until later in the day for it to warm up before I ride. Another bonus to this theory is as I age, the further south I shall move, so by the time I'm in my 60s I should be riding with Conchscooter in Florida. Although I hear New Zealand is nice. New Zealand it is then! Troubadour can you convert all that to metric please!